For forty years John Hadden and his father of the same name fought at the dinner table over politics, art, and various issues concerning America. One was haunted by what he had witnessed during his long CIA career, from Berlin to Tel Aviv; the other retreated to the Vermont woods to direct Shakespeare until finally he confronted his father at the table one last time with a tape recorder. 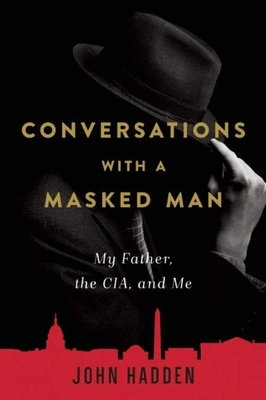 Conversations with a Masked Man is a series of conversations Hadden had with his father about the older man’s thirty-year career as a CIA officer and how American policy affected the family and the world. Father and son talk about John senior’s early life as a kid in Manhattan, his training at West Point, the stench of bodies in Dresden after the war, Berlin and Vienna in the late forties and fifties at the height of the Cold War, the follies of the Cuban missile crisis, how he disobeyed orders to bomb Cairo while he was station chief in Israel during the Six-Day War, and treacherous office politics in Washington. The story unfolds in dialogue alternating with the writer’s own memories and reflections. What emerges is hilarious, unexpectedly candid, and deeply personal. Combining the candid descriptions of the world of the CIA with intimate conversations between a father and son, this book is written for the political junkie, the psychologist, the art lover, or anybody who wonders who the hell their father really is. John Hadden has worked in the theater for forty years. He was artistic director of the Hubbard Hall Theater Company, a founding member of Shakespeare & Co, associate artist with We Players, and cofounder and artistic director of Counterpoint Theater in Boston. He has a theater BFA from SUNY Purchase and a writing MFA from Goddard College; his plays and a short film have won awards and have been seen in New York at LaMaMa ETC, PS 122, and the Ensemble Studio Theater, and published in The Good Ear Review and American Letters & Commentary. He has taught at numerous universities and schools; in Vermont he is a juried teaching artist with the VT Arts Council. His solo show, Travels with a Masked Man, is composed of excerpts from his forthcoming book of a similar name. John Hadden’s Conversations with a Masked Man is by turns a paternal biography, personal memoir, family saga, CIA history, and Cold War spy thriller  all folded into a psychologically penetrating work of literature. This book will also be of interest to anyone exploring the commonalities and divergences between one’s self and one’s parents with a view to better understanding the dynamic that has made us, respectively, who we are.